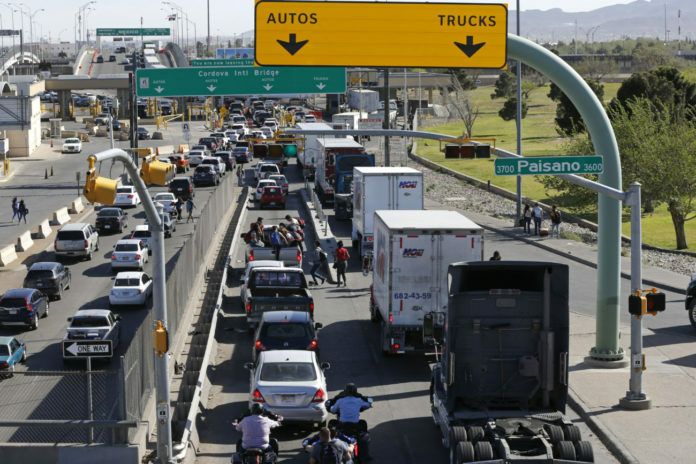 EL PASO, Texas (AP) — President Donald Trump’s threat to shut down the southern border raised fears Monday of dire economic consequences in the U.S. and an upheaval of daily life in a stretch of the country that relies on the international flow of not just goods and services but also students, families and workers. “Let’s hope the threat is nothing but a bad April Fools’ joke,” said economist Dan Griswold at the Mercatus Center at George Mason University in Virginia. He said Trump’s threat would be the “height of folly,” noting that an average of 15,000 trucks and $1.6 billion in goods cross the border every day. “If trade were interrupted, U.S. producers would suffer crippling disruptions of their supply chains, American families would see prices spike for food and cars, and U.S. exporters would be cut off from their third-largest market,” he said. In California’s Imperial Valley, across from Mexicali, Mexico, farmers rely on workers who come across every day from Mexico to harvest fields of lettuce, carrots, onions and other winter vegetables. Shopping mall parking lots in the region are filled with cars with Mexican plates. “If this happens — and I certainly hope it doesn’t — I’d hate to go into a grocery store four or five days later and see what it looks like,” Jungmeyer said. “Closing the border would cause an immediate depression in border state communities and, depending on the duration, a recession in the rest of the country,” he said. “Our business would end,” said Marta Salas, an employee at an El Paso shop near the border that sells plastic flowers that are used on the Mexican side by families holding quinceañeras, the traditional coming-of-age celebrations. “There are Americans who live there. I have nephews who come to UTEP, to grade school, to high school every day,” Salas said. Meanwhile, the Trump administration said Monday as many as 2,000 U.S. inspectors who screen cargo and vehicles at ports of entry along the Mexican border may be reassigned to help handle the surge of migrants. Currently, about 750 inspectors are being reassigned. That, too, could slow the movement of trucks and people across the border. “The Border Patrol agent said it’s going to get worse,” Amaya said. “The crisis at our border is worsening, and DHS will do everything in its power to end it,” Nielsen said.